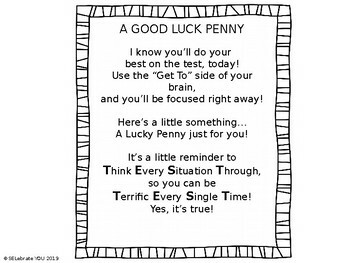 From state testing to any kind of testing, give your kids a A GOOD LUCK PENNY and watch their faces light up and their self confidence grow!! Please enjoy this free resource! It’s simple and easy. 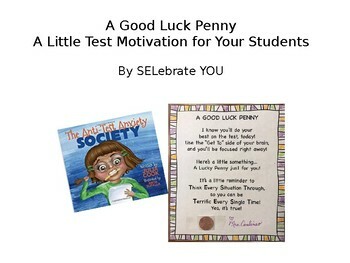 Just print it out, attach a Lucky Penny, sign it and hand it out on testing day!! 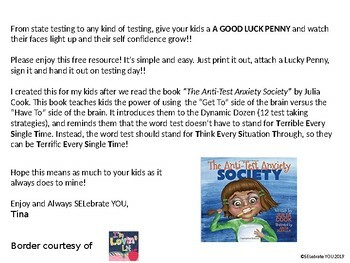 I created this for my kids after we read the book “The Anti-Test Anxiety Society” by Julia Cook. This book teaches kids the power of using the “Get To” side of the brain versus the “Have To” side of the brain. It introduces them to the Dynamic Dozen (12 test taking strategies), and reminds them that the word test doesn’t have to stand for Terrible Every Single Time. Instead, the word test should stand for Think Every Situation Through, so they can be Terrific Every Single Time!